The horizontal plate is the horizontal part of the palatine bone that forms the posterior portion of both the hard palate and the floor of the nasal cavity. The horizontal plate of the palatine bone has two surfaces: nasal surface and palatine surface. The nasal surface of the horizontal plate of the palatine bone forms part of the posterior portion of the floor of the nasal cavity and part of the inferior nasal meatus. lesser palatine foramina (leads to the lesser palatine canals). The greater palatine foramen is a small opening in the horizontal plate of the palatine bone which serves as a passage for the greater palatine nerve coming out from the greater palatine canal into the oral cavity. The greater palatine canal is a passage going through the sphenoid and palatine bones connecting the pterygopalatine fossa to the oral cavity. The greater palatine canal transmits the descending palatine vessels, the greater palatine nerve, and the lesser palatine nerve. Lesser palatine canals branch off from this canal. The lesser palatine foramen refers to one or more small foramina representing the openings in the hard palate (in the horizontal plate of the palatine bone) of the lesser palatine canal, that carries the lesser palatine nerves. The lesser palatine canal refers to one or more canals running vertically through the perpendicular plate of the palatine bone carrying the lesser palatine vessels and nerves to the lesser palatine foramina on the posterolateral surface of the hard palate. The perpendicular plate is the vertical part of the palatine bone which forms part of the medial wall of the maxillary sinus. The perpendicular plate of the palatine bone has two surfaces: nasal surface and maxillary surface. The perpendicular plate also features the sphenopalatine notch. The nasal surface of the perpendicular plate of the palatine bone forms the superoposterior part of the nasal septum and articulates superiorly with the cribriform plate of the ethmoid bone. The maxillary surface of the perpendicular plate of the palatine bone is rough and irregular, and articulates with the nasal surface of the maxilla. 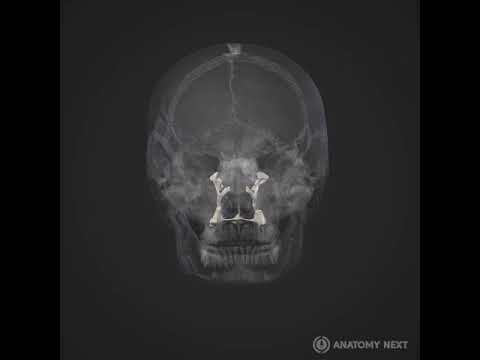 The sphenopalatine notch is located on the perpendicular plate of the palatine bone and together with the body of the sphenoid bone forms the sphenopalatine foramen, which connects the nasal cavity with the pterygopalatine fossa.